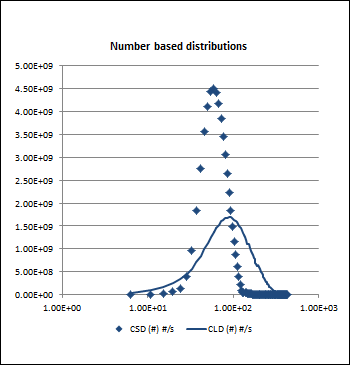 When completing the publication of our latest monthly update to the DynoChem online library of tools, we revised our CSD (crystal size distribution) to CLD (chord length distribution) conversion utility and the latest file is here. We think this tool has educational as well as practical value, with plots of size distribution statistics and indications of how true CSD relates to what we can measure using on-line laser backscattering (an apparent CLD) or off-line laser diffraction (an apparent spherical equivalent diameter distribution). Like all of our tools, we are keen to receive feedback by email to our support team and to make further enhancements in due course. If you like it, or think it can be improved, let us know. If you like the joke, or can improve it, write a comment. You may know it as "solvent switch", "solvent swap", "solvent exchange", "strip and replace", "feed and bleed" or any number of other names; the fact is, if you make pharmaceutical intermediates or APIs, you are doing this in almost every manufacturing stage, sometimes more then once. Now you can find out how many volumes are needed, how much time it will take, which vessel to select and what the composition trajectory will be, in even less time than before. Next week there is a great opportunity for a refresher on solvent swap, as our Chemical Engineering webinar series features this topic in both of Tuesday's sessions. Attend live if you can; register to make sure you receive a link to the recording. If you're new to the area, there some more good background information on solvent swap here. Ed Paul of Merck opened up this field in the early 1970s following observations of mixing-sensitive reactions at industrial scale and completed a PhD on the topic under Robert Treybal. John Bourne started a series of systematic investigations through the 1980s and 1990s and together with Jerzy Baldyga laid the basis for quantitative predictions in this area. There continues to be a high level of interest in micromixing and applying the concepts to solve practical problems that arise frequently in both lab and plant. Bourne and Baldyga coined the term 'mesomixing' and it turns out that this may be the more important phenomenon in reactions at scale, with practical feed addition times of a few hours. Researchers needed well characterized reaction kinetics in order to study the field and a number of 'Bourne reactions' emerged, each showing sensitivity of the final (end of reaction) product distribution to fluid mixing conditions during reaction. One such reaction is an ester hydrolysis with competing parallel neutralization: the fraction of the limiting caustic reactant that forms ethanol is denoted 'XQ' and in general is sensitive to mixing. Mathematical models played a central role in this research and while there is still some debate about the 'best model', the Engulfment approach from Baldyga and Bourne probably has the most support. This is easily applied to plug flow reactors (PFRs) with the reaction zone growing as the fluid travels downstream. For systems with backmixing, such as a fed batch reactor or a CSTR, a series of plug flow circulations may be used to simulate the successive changes in XQ over time and the final or steady state result. Several of the papers referred to above could be considered quite complex and challenging for non-specialists to apply. Three of our team obtained PhDs in this field during the 1990s. As a result, the DynoChem Resources online library contains a PFR template for meso- and micromixing as well as much background material and a vessel utility to estimate the various time constants required and to check for 'jetting effects' or feed pipe backmixing. We also developed a feed zone model that captures the behaviour of the Engulfment model and mesomixing in stirred vessels without simulating a series of successive PFR circulations. This feed zone can easily be included in any single or multi-phase simulation (e.g. antisolvent crystallization) in order to predict the effects of locally high concentrations or temperatures near a feed point. The key concept in this feed zone model is to calculate how quickly the feed is diluted to a composition close to the average in the vessel; this time scale depends through the Engulfment model on the meso- and micromixing time constants, which in turn depend on the reactor geometry and operating conditions. A full picture is obtained by combining the results of our utilities with a dynamic model. 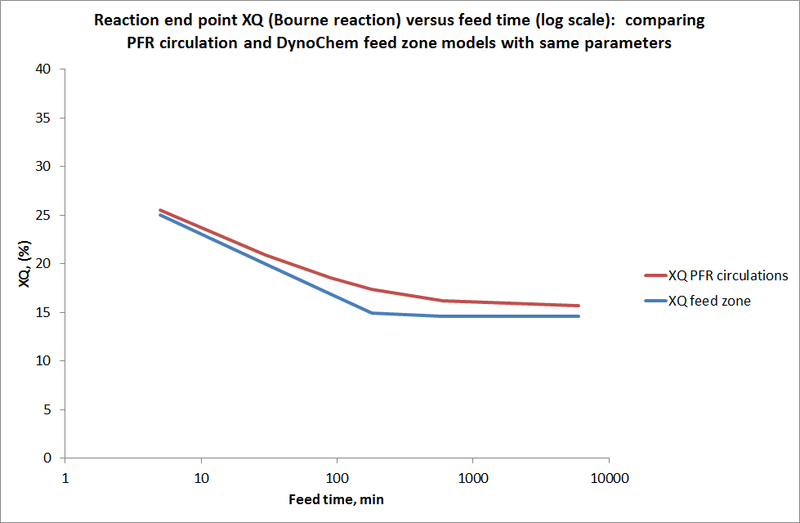 The first plot below shows XQ predicted under typical reaction conditions using PFR circulations compared with XQ from the feed zone model, in a vessel of 800L volume to which 16L of caustic were added over feed times varying from 5 minutes (mesomixing controlled, at 800L scale) to 100 hours (micromixing controlled). Perfect mixing would give XQ of almost zero, while complete segregation would give 50%. The results range from 15% to 25% in this case. The feed zone model predicts XQ within a few percent of the PFR circulation model and shows similar mixing-sensitivity of the process in this operating range with a much simpler model implementation. 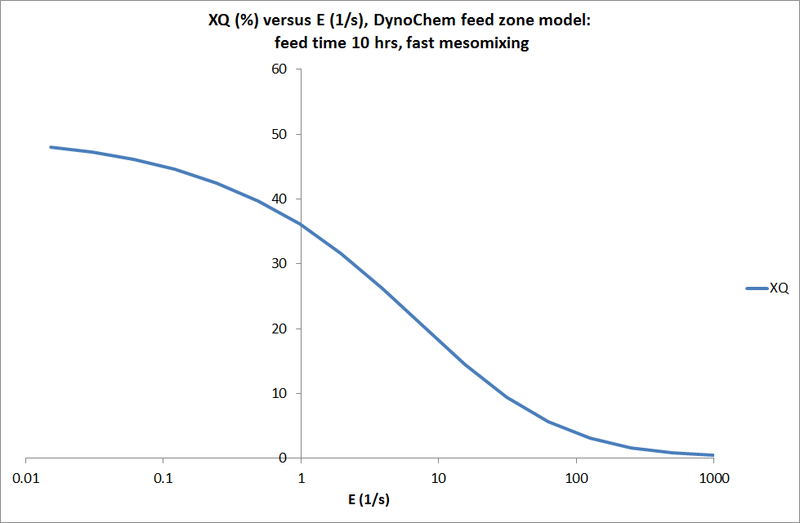 The second plot below shows predictions from the feed zone model when the agitation conditions (and thereby the Engulfment frequency) are changed for a fixed addition time of 10 hours (micromixing controlled). At the extremes of very slow and very rapid micromixing, XQ tends to 50% and 0% respectively. Subsequent posts will discuss use of these reactions with DynoChem to characterize lab and plant equipment and application of the models to predict mixing effects on crystallization.